Grandma Rose was a lover of beauty and had an artist’s soul. Her house was decorated with her own art works and the works of her many friends. Her backyard leading out to the barn was also crafted by her loving and expressive hands. It had a small coy pond on the back patio surrounded by an expansive garden where lavish bounties of perennial flowers grew and bloomed of their own accord each spring. She was one of the only people I have ever known who picked and arranged flowers from her own garden. There was often a vase of them in the four-seasons room where she had most meals overlooking the blooms and watching the bird feeder by the window. As her death grew nearer, her house began to fill with more and more flowers- roses of all colors (of course), also carnations, lilies, asters, and babies breath everywhere. 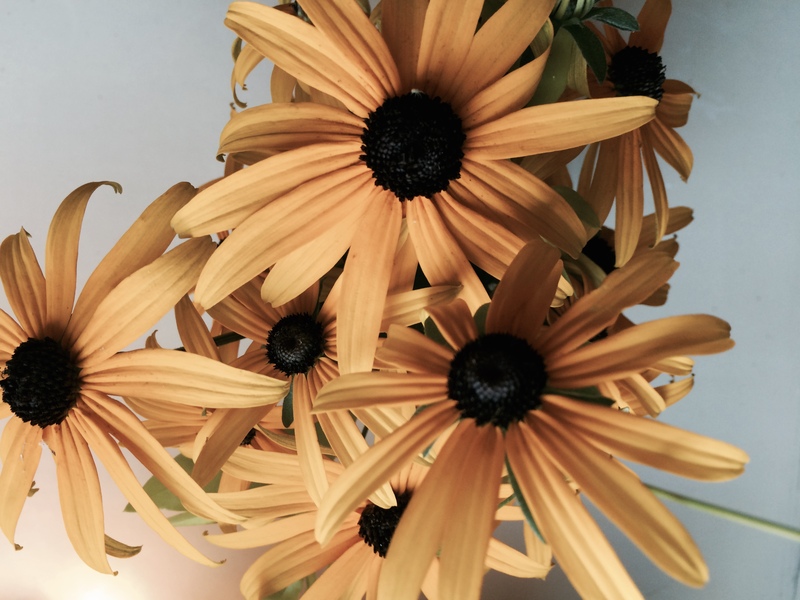 Her favorites were two bunches of sunflowers that arrived with no note; she mentioned them to everyone but never found out from whom they came. In June before Grandma passed, I attended a retreat with Mirabai Starr, speaker, teacher and author. At the retreat, Mirabai shared her own experiences with the death of loved ones- both her first love and her fifteen-year-old daughter. After her daughter’s death, her friend encouraged her to arrange flowers on the casket. While at first she was hesitant, as she began placing the flowers, she found the ritual to be soothing, healing, beautiful. She said to this day, flower arrangement is a sacred time for her and part of her spiritual practice- a moment of light out of the darkness. 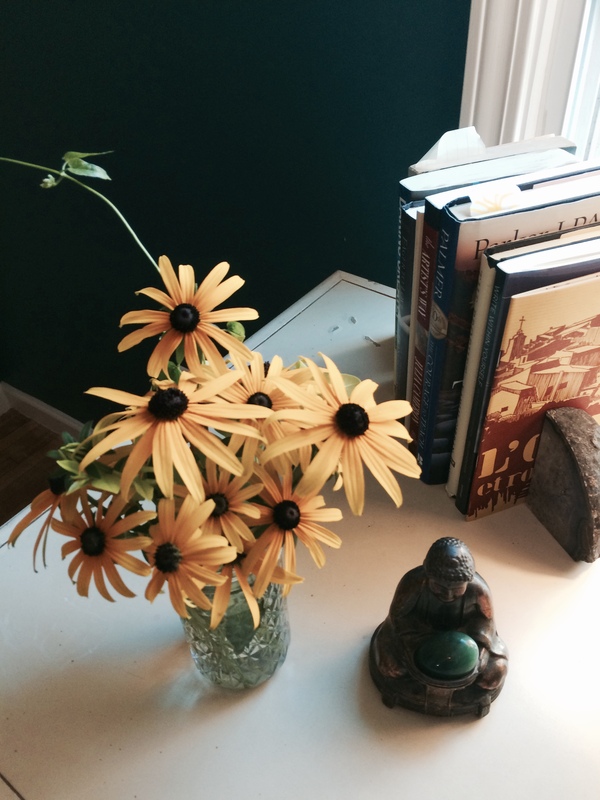 I began my own practice of clipping the flowers from my garden and arranging them because of my five-year-old son. 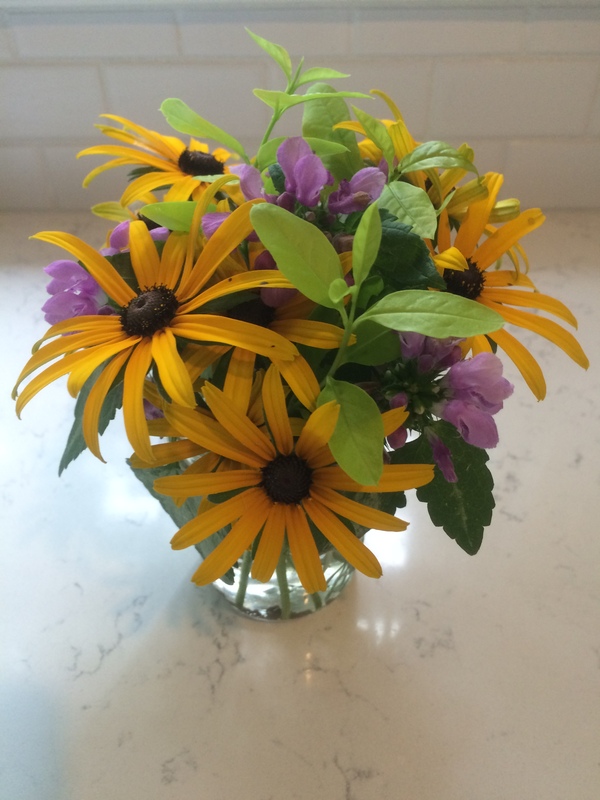 All summer, he has asked to go outside to “pick flowers for mommy.” When he comes back in the house, I am gifted with miraculously perfect arrangements (at least in my eyes). 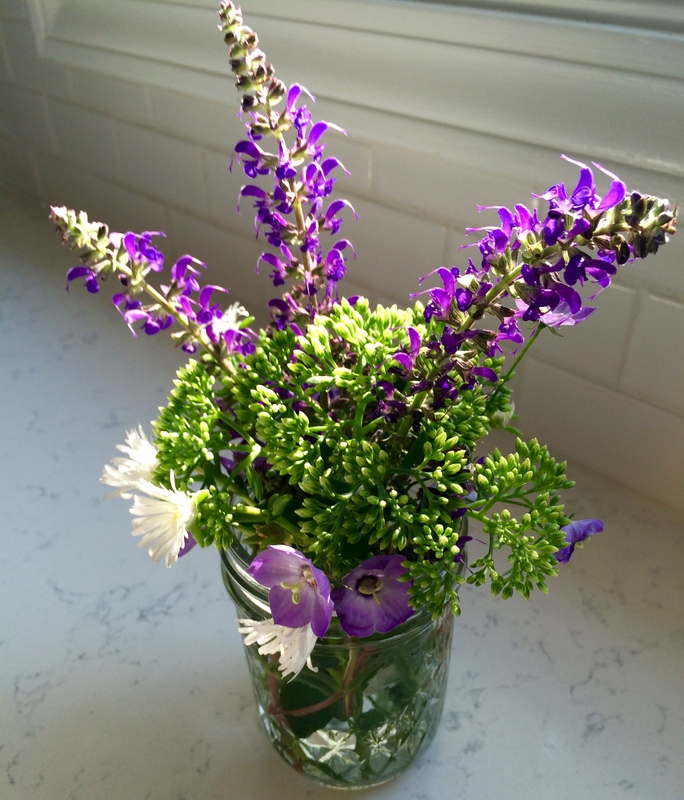 Eventually, I began filling mason jars with his flowers. I also started going out to the garden with him- gathering flowers, making arrangements and placing them around the house to enjoy. In Japan, there is an entire art form dedicated to flower arrangement called Ikebana (living flowers). Arrangements in Ikebana are to be created silently, a communion of nature and person. It is considered not only an art, but also a spiritual practice. 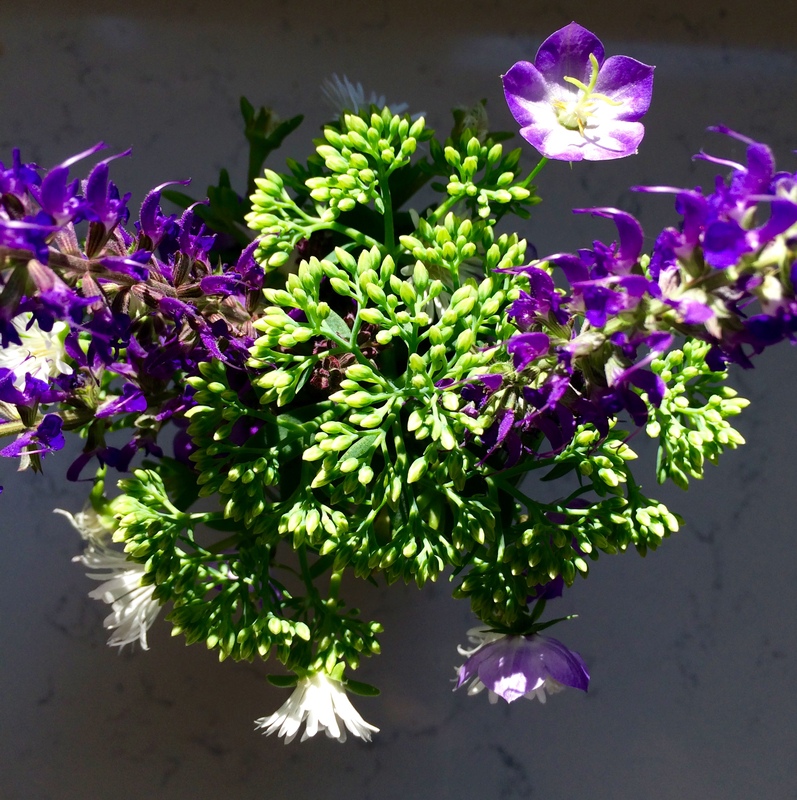 While I usually do not create my arrangements in silence, it has been no less a mindfulness practice, a healing and joyous experience for me to be creative with those whom I love. The connection to between my arrangement of flowers from the garden and my memories of grandma did not occur to me until a few weeks ago. My mom was staying with us for our float experience and a brunch I was hosting for the family the next day. In preparation for our family, I asked my mom if she wanted to come outside and pick flowers with us. We all went out to the garden- my five-year-old son, my mother and me. We carefully cut and made piles of various flowers and then arranged them together in vases. My mom snuck over to the corner of the neighbor’s yard to pick sun-yellow blooms. She clipped bright, tender greenery from the bush out back to place around them. I titled the arrangement one way and then another and asked her opinions on whether more flowers were needed and where. Sawyer was coached in the art of trimming stems long enough to reach the water filling the jar. It was a creative process, living as art, making something beautiful. Later, when my house was full of the family Grandma created, the good food we had all made together, and beautiful flower arrangements created by three generations of people and influenced by a fourth, I realized that my Grandma’s lovely habit had transcended generations and was being carried on through my own family now. In a moment of silence and solitude this last weekend, I decided to create arrangements on my own. I dedicate these, and so many other fortunate things in my life and the lives of others, to my grandmother and her ever-present spirit. Even death does not surpass our ability to love, to be loved and to be ever-present for those whom we love. What rituals, traditions or gifts still flourish in your life despite the physical absence of someone? Post your comments in this post or send your thoughts via the Contact tab. This is the first in an on-going series of “The Art of Living” posts.